The Sarod; one of the most capturing stringed instruments from India and is known for its deep, weighty, introspective sounds. The origins of the sarod go back almost 15 centuries back to the Persian rabab. Sarod, meaning “beautiful melody” in Persian, came to its current form about 250 years ago. 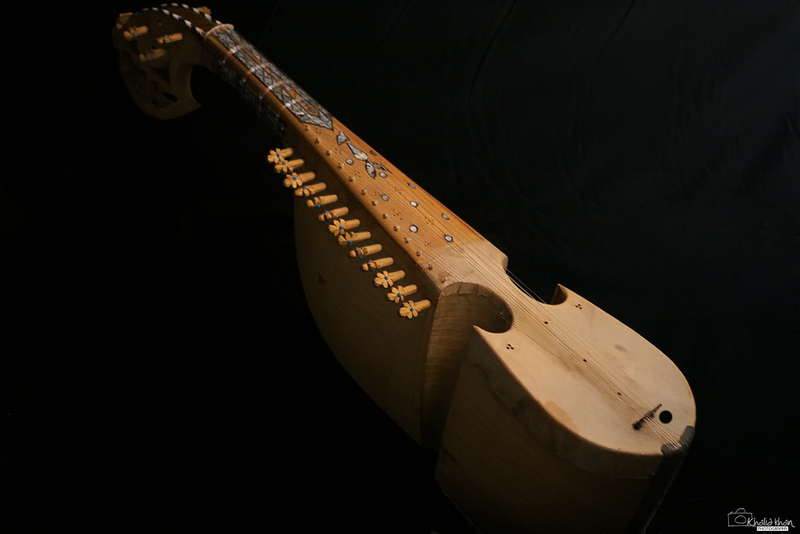 The rababs’ fingerboard has frets and is made out of wood and used to be covered with cat-guts as strings. To create the typical (Indian classical) sound and to emulate the movements of the voice, they evolved the form of the original instrument. Usually the sarod is made of tun– or teakwood with a steel plate as fingerboard without frets. The base got rounder and covered by goatskin which functions as a resonator. The 23 strings, often steel and brass, consist of 15 resonating or sympathetic (taraf), 3 rhythmical or drone and 5 melody strings. Where the left hand, played on the tip of the fingernails, covers the melodious side of the instrument. The right hand, traditionally played with a coconut shell pick or plectrum (Jawwa), focuses on the rhythmical variations. This evolution of the rabab into the sarod, made it possible for the artists to create another dimension of musicality. On the one hand, the musician could now play slow, gliding and resonating notes, which remind of the ancient Veena (India’s ancient musical instrument), on the other hand the typical strong rhythmical rabab techniques. This combination of playing techniques together with the typical metallic echoing sounds, is what attracts a wide range of musicians and lovers of music. There have been various great and legendary artists whose music and names still resonate today. In the mid-nineteenth century there were three notable sarodiya’s from different families in the famous Shahjahanpur area of India. Enayat Ali (Shahjahanpur, 1883), Niamatullah Khan (Bulandsahar, 1809) and Gulam Ali (Gwalior). All three were descendents of the Afghan soldiers turned musicians who came into India centuries ago. 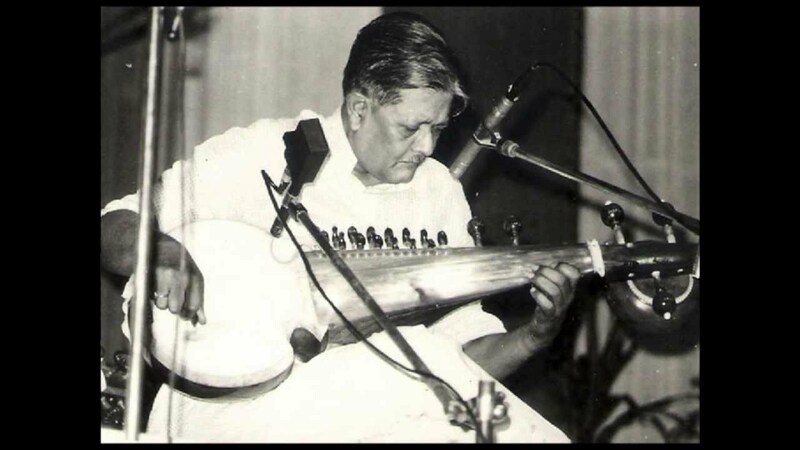 The second half of the 20th century has been mainly vibrating around the music of maestros like Ustad Ali Akbar Khan (Bangladesh, 1922), Pandit Buddhadev Das Gupta (Bhagalpur, 1933) and Ustad Amjad Ali Khan (Gwalior 1945). Today in The Netherlands, there are only two notable “sarodiya’s” practising this instrument. Both (Martijn Baaijens & Avi Kishna) trained and guided by their guru Sri Koustuv Ray (Kolkota, 1955-2017). Unfortunately he passed away in the early summer of 2017. Sri Koustuv Ray, also known as Gungun, got his training and guidance by earlier mentioned Pandit Buddhadev Dasgupta and late Pandit Radhika Mohan Moitra. Radhika Mohan Moitra descents from the linage of sarodiya’s going back to the dawn of this captivating instrument. You are listening to a live recording of Sri Koustuv Ray on his Sarod, accompanied by his friend Sri Sandeep Bhattacharya on the Tabla. The Raga, Chandrima, is created by Sri Koustuv Ray himself. The melody (gat) and the full recital were created and improvised on the spot. This performance was recorded live in Amsterdam in the mid 90’s.